A competition is underway to find new railway braking systems that overcome the wet leaves on the line problem. Jonathan Newell examines one contender. Although the well-worn anecdote about wet leaves bringing the UK rail network to a standstill is wearing a bit thin now, autumn leaf falls and winter conditions can have a serious effect on the timetabling of trains, to allow them longer times and greater distances to stop due to the condition of the rails. To eliminate this problem once and for all, Rail Safety and Standards Board (RSSB) launched a competition amongst technology suppliers to find a way of halting a train efficiently regardless of rail adhesion. With so much mass and significant speeds, the stopping power of a train is a critical factor for safe rail operations. And yet the entire ability to bring a train to a standstill relies on the wheel to rail interface. Cars have big, compressible rubber tyres with a reasonable contact patch and a rough, high friction surface against which to operate. Trains, on the other hand, have incompressible steel wheels with a small contact patch, operating against an equally incompressible steel rail with a surface that has a relatively low coefficient of friction which deteriorates further when wet, icy or contaminated with mulch, leaves and other debris. These timetabling differences alone are responsible for traveller frustration, but other factors can lead to further delays. According to Benton, it requires a great deal of judgement and experience in bad weather conditions for the driver to bring a train to a controlled stop accurately, without running through a red signal or overshooting a platform. If the emergency brake needs to be used, further delays are experienced whilst the brakes reset. To overcome this, RSSB launched the Predictable and Optimised Braking Challenge and seven projects are currently in the feasibility phase of the project. By March 2016, these seven projects will be reduced to the most promising two or three which will go through to the two-year prototyping phase. Three of the projects are concentrating on rail conditioning. One way of improving braking performance is to improve the friction coefficient of the rail. This has been done for decades to a very limited extent through pumping sand through pipes to the leading edge of the wheel. Although this sanding technique has been improved over the years it has no significant impact on adhesion. Alternative methods are being proposed by Sheffield University and The Imagination Factory. Other projects are examining alternative braking technology with train brake specialist Federal Mogul looking to improve existing brake systems and Alstom proposing an eddy current braking system. The principle of electromagnetic energy being used as a retardation mechanism is also being studied by Newcastle University and Mole Solutions, with both organisations working on alternative methods of using linear induction motors as auxiliary braking when poor wheel adhesion is extending stopping distances. To understand more about the use of linear induction motors in such an application, we spoke to Bob Silverthorne, Mole Solutions’ Development Director. According to Silverthorne, it doesn’t matter how much you improve wheel-based brakes with larger braking surfaces or servo motors because the adhesion between the wheel and the rail is the limiting factor; and therefore this needs to be taken out of the equation to gain the necessary improvements. The proposed system works by constantly comparing actual braking performance to the optimum rate of deceleration for a train. To ensure the comfort of passengers, this optimum level is 1.2m/s2. At station and red signal approaches, train sensors measure the deceleration rate and apply additional “off-train” braking using the linear induction motors as necessary. Apart from the control system, there is also a pneumatically-operated reaction plate that can be raised and lowered manually by the driver or automatically by the train management system, as well as an electromagnet in the track. The reaction plate forms a structural part of the train itself and the braking force is applied through this rather than the wheels. Silverthorne explained that some infrastructure changes will be required, but these have been carefully engineered so they don’t interfere with other electrical or magnetic in-track or trackside equipment. Since the project scope covers predictive braking conditions, the extent of infrastructure changes will be limited to station approaches, crossings and signal hot-spots with a history of red light over-runs. The idea for using linear induction motors for braking originated from Mole Solutions’ core business area, which is the movement of freight using unmanned capsules running through pipelines. Silverthorne explains that although the capsules run on wheels, the acceleration and braking forces are not applied through them and so friction isn’t a factor in stopping ability. The company is already four months into the feasibility study and computer modelling has been used to establish the basic design parameters. A facility is now being prepared to validate the model and demonstrate its effectiveness on low mass and velocity vehicles. The current specification of the RSSB project limits the application to predictable braking situations and not emergency braking. But the technology isn’t limited to the 1.2 m/s2 deceleration that’s comfortable for passengers. Emergency braking can increase this figure to 1.8 or as much as 2.0 m/s2, a figure that could even be much higher for unmanned autonomous vehicles. The downfall of off-train braking systems for emergencies is that the unpredictable nature prevents selective infrastructure changes. For it to be effective, it has to be deployed throughout the network at costs that would not be prohibitive. Goods trains could withstand higher braking forces, but according to RSSB, the priority on goods traffic is to keep it moving and prevent as many stops and starts as possible. Investing in high technology braking systems for the rail freight industry is unlikely to gain the support of the freight operators. The seven competitors that are currently performing feasibility studies will go through the next judging round within the first quarter of 2016, at which point RSSB’s Future Railway programmes panel will select two or three projects to take forward to the next stage. 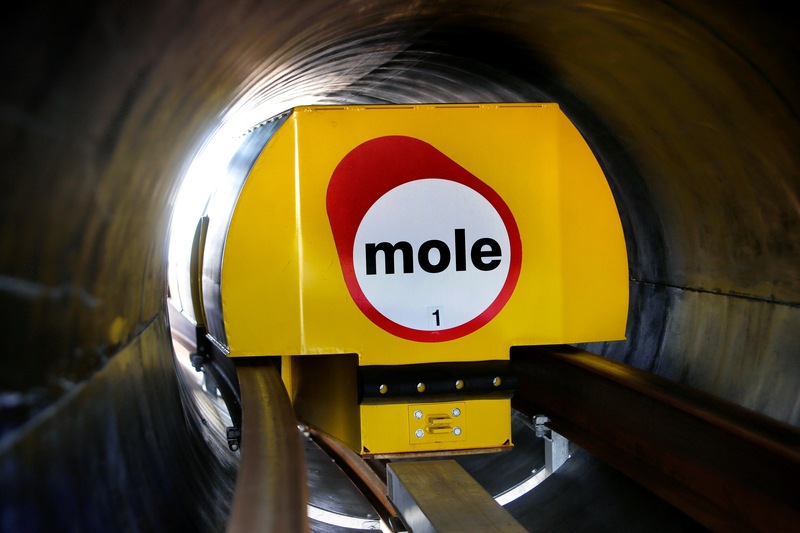 According to Mole Solutions, if the results of the feasibility study are suitably compelling to receive the second stage of funding, we’ll develop pre-production sub-system hardware and undertake tests with higher mass and velocity vehicles at an enhanced testing facility at Alconbury Weald Enterprise Campus. When will RSSB’s vision of having enhanced braking systems fitted to UK rolling stock and enabling winter timetables to be the same as summer services actually be reality? “Product acceptance requirements and the associated testing will take time so it’s likely to be into first couple of years of the next decade when we see trains fitted with such equipment,” Benton concludes.